Last week my friend J and I headed down to Anderson's Bookshop for a history night. They had Sally M. Walker (author of Secrets of a Civil War Submarine), Larry Day (illustrator of the Cybils finalist Duel! ), and Candace Fleming (author of The Lincolns). All the authors gave great talks, but I was especially excited to see Sally M. Walker because I so loved Secrets of a Civil War Submarine. She talked a bit about her newest release: Written in Bone. I wanted to read it before, but hearing her talk about it makes me want to read it even more! 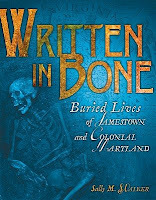 She accompanied a forensic anthropologist who excavated graves at the colony of Jamestown. By studying the bones in these unmarked graves, scientists found out all kinds of information about the people who lived and died there. It kinda makes you think... what might your bones say about you? Larry Day talked about his research for the illustrations in Duel! and about the special details he put into the pictures. And Candace Fleming totally made me want to read a book about Lincoln (which is something I never thought would happen... no offense, but in Illinois, Lincoln is kind of shoved down our throats...). 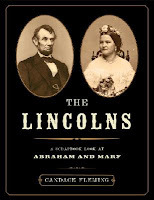 She talked about her unique approach to capturing the stories of Lincoln and his wife by including Mary Todd Lincoln. All of the authors gave great talks and answered questions and signed books. It was another great author event by Anderson's Bookshop (what would we do without them?). Happy Nonfiction Monday! The roundup is over at Books Together.